AOL previewed a new set of logos this week, and is often the case with rebranding, the reaction from designers has been mixed. Gone is the little running guy and the blue triple triangle object, and in comes a variety of photographic and graphic logos. Oh and itâ€™s also no longer uppercase AOL but rather Aol with a full stop. Another unusual feature of the logo is the use of photography rather than vector graphics or symbols. The new branding was carried out in consultation with Wolf Olins and a number of artists and graphic designers were involved including Universal Everything, GHAVA and Dylan Griffin. The concept is that the image will change while the type treatment will remain consistent. Our new identity is uniquely dynamic. 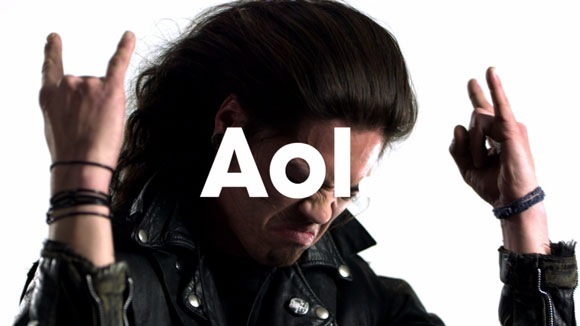 Our business is focused on creating world-class experiences for consumers and AOL is centered on creative and talented peopleâ€“employees, partners, and advertisers. We have a clear strategy that we are passionate about and we plan on standing behind the AOL brand as we take the company into the next decade. As for the new full stop (period), Tim Armstrong described it as â€œthe AOL dotâ€� because â€œthe dot is the pivot point for what comes after AOL,â€� That may be websites, email or other surprises. The new branding will kick in from December 10 this year when Aol starts trading on the New York Stock Exchange. Personally, I like the idea of the changing images but thereâ€™s a somewhat unfinished look about each one and Iâ€™ve seen them described quite aptly elsewhere as looking more like a mood board than a logo. It will be interesting to see how itâ€™s implemented, but it all seems a little vague. You can read the full AOL press release here. So what do you think of the new branding?